Renal disease is commonly seen in rabbits, but often can be underdiagnosed or mistaken for other conditions. Since the causes can vary, a veterinarian will first want to rule out some other potential causes for the rabbit’s symptoms, including lymphoma, abscesses, or other types of kidney infections. In the case of Edison, a three- and- a half-year-old, male neutered rabbit; the primary referring veterinarian (rDVM) was instrumental in providing baseline diagnostics that led to the clinical diagnosis and successful treatment plan. 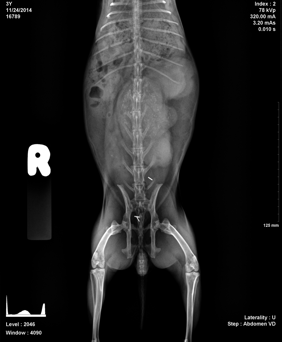 Edison, a three- and- a half –year old, male, neutered rabbit was referred for evaluation of abdominal masses that were found on routine physical examination. Referring veterinarian (rDVM) diagnostics included blood work, radiographs, and ultrasound guided fine-needle aspiration of the mass. Physical examination revealed mild conjunctival hyperemia with no ocular or nasal discharge and multiple firm masses in the abdomen. Blood work showed hyperglobulinemia, and a leukocytosis with monocytosis, heterophilia, and lymphopenia. Cytology of FNA of the masses revealed ‘necrotic or cystic material’ with probable spindle cells seen. Based on results of initial diagnostics, what are your differentials? What do you recommend as the next step? Abdominal computed tomography (CT) with contrast was recommended to determine further lesion extent and determine a treatment plan. CT revealed an extensive multi-lobulated left retroperitoneal mass resulting in marked left hydronephrosis and proximal hydroureter as well as a mass in the dorsal hypaxial musculature. The primary differential of the lesion was a urinary tract carcinoma with muscular metastases. Despite a guarded prognosis, the owner elected exploratory surgery. 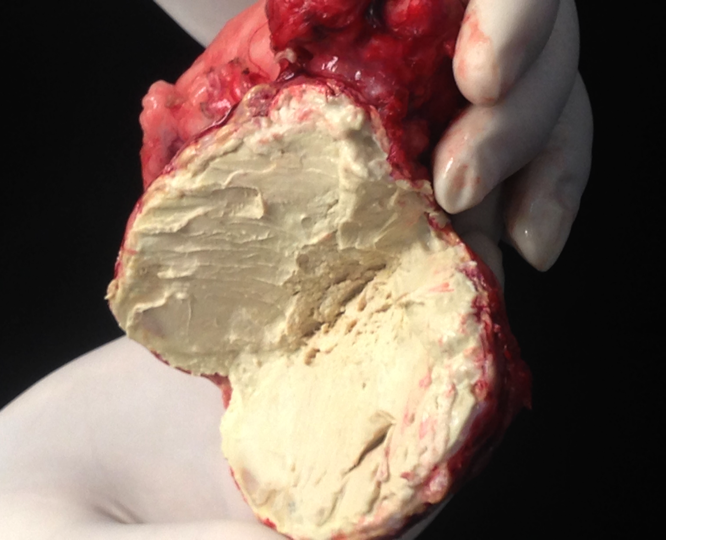 The retroperitoneal mass, hypaxial mass, left kidney and ureter were excised using blunt and sharp dissection along with a LigaSure PreciseTM instrument and were submitted for histopathologic examination and aerobic/anaerobic bacterial culture and sensitivity. Histopathology showed large coalescing abscesses with Gram-positive cocci involving the left kidney and renal pelvis, suspected to be secondary to ascending pyelonephritis. Bacterial culture revealed the heavy growth of Staphylococcus aureus sensitive to all tested antibiotics except rifampin. The patient recovered uneventfully but presented three months later with a row of approximately 15, 0.5 x 2 cm, subcutaneous swellings associated with the previous incision. The abnormal tissue was excised, determined to be multiple small abscesses, and submitted for a repeat culture and sensitivity panel. Abscesses reoccurred and were treated with the rDVM along with a change in antibiotics. 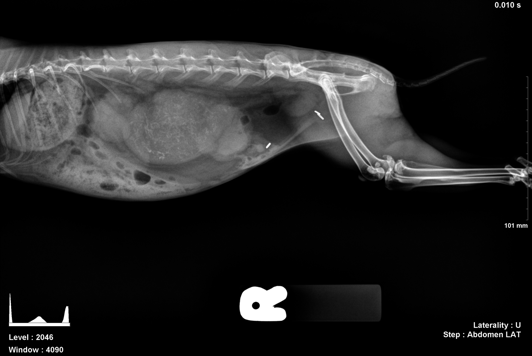 This case highlights the potential for multifocal abscesses to present similarly to metastatic neoplasia in rabbits. Note the marked left hydronephrosis and proximal hydroureter. Note displacement of abdominal contents by the large retroperitoneal mass. Multiple masses are also seen near the entry of the left ureter into the bladder. Cross-section of mass following surgical removal. Renal disease is a fairly common presentation in rabbits. One retrospective study revealed renal lesions in 77 (32.5%) of 237 rabbits that were found dead or euthanized for illness. Renal lesions were found in 19 (25%) of apparently ‘healthy’ rabbits. These reports suggest that renal disease is likely underdiagnosed or underreported in rabbits. Lesions common in young rabbits (less than 5 months old) include renal abscesses, staphylococcal nephritis, pyelonephritis, and pyelitis. Renal lesions common in older rabbits (greater than 10 months old) include renal fibrosis and dystrophic calcification. Amyloidosis has also been reported in rabbits. Because rabbits have a relatively high fractional urinary calcium excretion (45-60% when compared to <2% in other mammals), hypercalciuria and urolithiasis (calcium carbonate calculi) are commonly seen. Cystitis and acute and chronic renal failure have been reported in rabbits secondary to infections including: Pseudomonas sp, E. coli, P. multocida, Staph. sp, and Encephalitozoon cuniculi. Rabbits are a common model for renal research and there are multiple personal communications describing nephrectomy in rabbits. A 3. 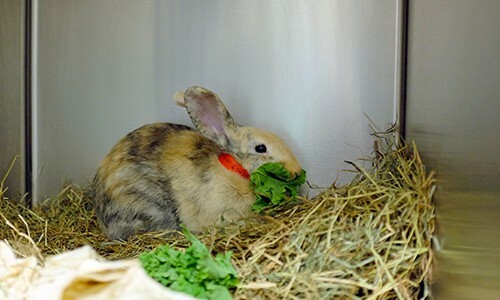 4-year-old rabbit with nephrosis had a successful nephrectomy and recovered uneventfully. 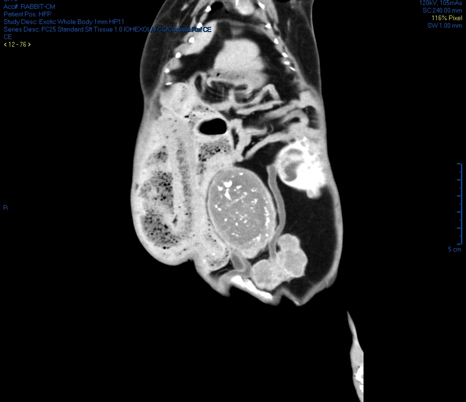 Nephrectomy was necessary in a case of a rabbit with polycythemia secondary to nephroblastoma. Indications for nephrectomy include obstructive calculus with hydronephrosis, neoplasia, and pyelonephritis refractory to medical management. Prior to considering nephrectomy, ultrasound, IV pyelography, and/or scintigraphy may be warranted to evaluate functional capacity of the contralateral kidney. The Zoological Companion Animal Medicine Service works closely with multiple specialty departments at the Cummings Veterinary Medical Center to ensure the best care for exotic pets. 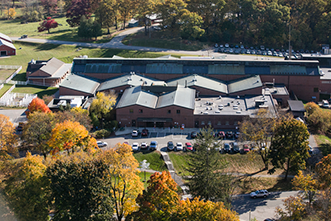 Edison’s care involved a team approach that included members of the radiology, surgical, and pathology departments, along with the Zoological Companion Animal Medicine staff. We also relied on the wonderful pre-referral diagnostics of Dr. Corey Blake to help us determine the best plan for Edison. 1. Hess L, Tater K. Dermatologic diseases. In: Quesenberry KE, Carpenter JW (eds). Ferrets, Rabbits and Rodents, 3rd ed. St. Louis, MO. Elsevier; 2012:232-244. 2. Jenkins J. Skin disorders of the rabbit. V Clin N Am Exotic Pet Prac. 2001;4:543-563. 3. Graham J. Rabbit wound management. V Clin N Am Exotic Pet Prac. 2004;7:37-50. 4. Harcourt-Brown F. Abscesses. In: Harcourt-Brown F (ed). Textbook of Rabbit Medicine, Oxford, UK. Elsevier;2002:206-223. 5. Bamberger DM, Herndon BL, Betin KM, Gerding DN. Neutrophil chemotaxis and adherence in vitro and localization in vivo in rabbits with Staphylococcus aureus abscesses. J Lab Clin Med. 1989;114:135-141. *Acknowledgment: We would like to thank Dr. Corey Blake (Oceanside Animal Hospital, Sandwich, MA) for the referral of this interesting case.